Great images, Alex. I’m looking forward to many more in 2010 . . . Thanks Rick! And of course we’re all looking forward to seeing your stuff in the coming year. Thank you. Interesting style differences; yours are less artistic and more precise than your “best of.” The photographers’ personal relationships with nature coming through in their work. Thought you might have limited it to nine, but why not treat yourself in your own house? If you don’t do it, no one will. -The bug pic is so colourful for a face of death! -I like the autumn tones in the walking sticks (ON boy). -The ant lion gets pretty artistic … I like it! This strikes me as a very fair assessment. Most of the photographers I featured in the “Best Of” list are artists. I am not- I’m more of a naturalist/scientist, and my images are intended to capture particular behaviors or particular species rather than any particular aesthetic. So within the confines of the subject I aim for the best aesthetic I can. But that’s a different thing than setting out to create a compelling image foremost. I was hoping the giant water bug would be in here – that’s my favorite. The parasitic fly is my favorite in terms of a natural history moment. 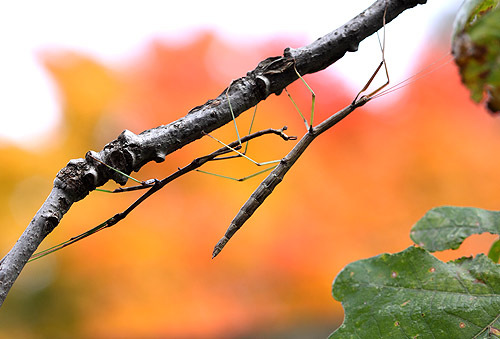 The walkingstick should also be mentioned – the autumn tones in the background really make it. The water Bug yes it Ok. But my all time favorite is one from last year collection Lonely it has very thing. @Jack Jumper: where is the “Lonely” pic? This is the second year in a row you’ve mentioned it. Great photos! The parasitic fly photo is tied with the antlion photo for my personal favorite. The trap-jaw ant foraging on the decomposing leaf is a beautiful composition – I’m a sucker for photographs that look like paintings (as opposed to paintings that look like photographs). It would look great on a cover of a book on soil zoology or at poster size on a living room wall. I should agree with Dave. I love leaf litter ants, so I love the trap-jaw ant photo, congratulations! Feliz Año Nuevo 2010 y no dejes de hacer fotos. The giant water bug and the trap-jaw ant from Argentena are my favorites…but you make it hard to choose as all of these are spectacular! You really had a great 2009 Alex1 Her’s looking for more of these in 2010! They’re all spectacular, but I can’t help but say the water bug gets my vote every time. It’s so otherworldly in that pose. You did a great job capturing it: the stillness, the predatory instinct, the watchful eyes, the comfort under the surface. And I’m definitely looking forward to the marvels you come up with for 2010.